The proposal to replace the terracotta tiles in the Nave was first mooted in 2013. The uneven worn out surfaces and the small potholes caused a few to trip and posed difficulties for the elderly. Discussions started with the Preservation of Sites and Monuments (PSM) on the types of tiles we could use, and internally, there was a discussion on whether to replace only the damaged tiles, estimated then at about 30 per cent, or the entire flooring. This is not the first time that the tiles are replaced; in our living history, ad hoc replacement was carried out on the worn-out tiles. The last time when a greater number of tiles were replaced occurred in the late 1980s, during a major repair of the Main Cathedral building, which included the installation of air-conditioning in the Nave. It became necessary to hack off some tiles so that the air-conditioning pipes could be laid underneath the floor. Some may recall that there were different terracotta- type tiles in some places along the North and South Aisles. At that time, the terracotta tiles were sourced by a renovation contractor repairing the aisle windows and clerestory fans. he managed to salvage terracotta tiles from those pre-war houses earmarked for demolition, and which matched the tiles in the Nave. Almost 30 years on, we were faced with a larger job. More of the terracotta tiled areas had disintegrated. The Finance and Property Committee (FPC) decided that it was timely to replace all the tiles. As a national monument, we are not at liberty to change the look and style of the building. 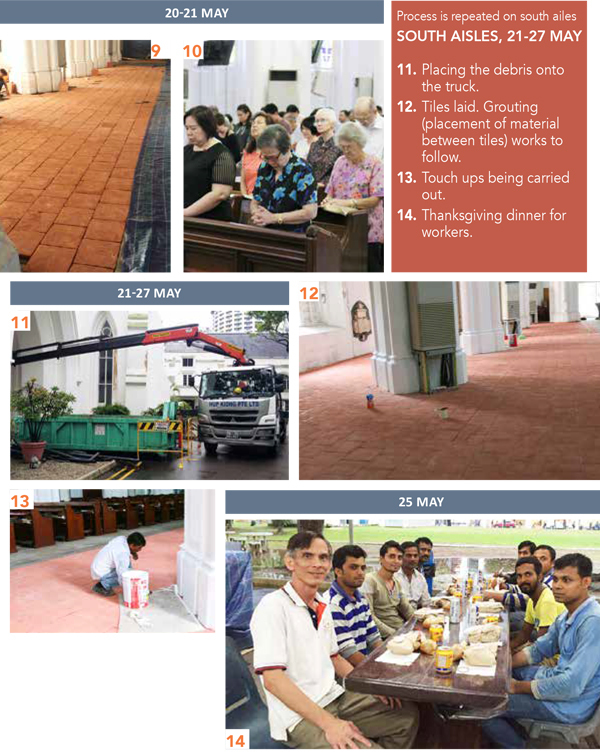 PSM advised that although preservation guidelines made no mention of the floor finish, they would recommend that the Cathedral repair and restore the terracotta tiles with a like-for-like replacement. An attempt to source for an appropriate replacement led us to shortlist three possible supplies from China, Italy and Spain. The FPC eventually decided on the handmade terracotta tiles from Spain. After much deliberation, the FPC approved the purchase of the tiles in Jan 2017 and a date was set for the work to be done over Lent, when there would be fewer events in the Nave. however, the shipment was delayed due to some important diplomatic cargo that took the ship on a longer route. The work was rescheduled to the second half of May 2017. 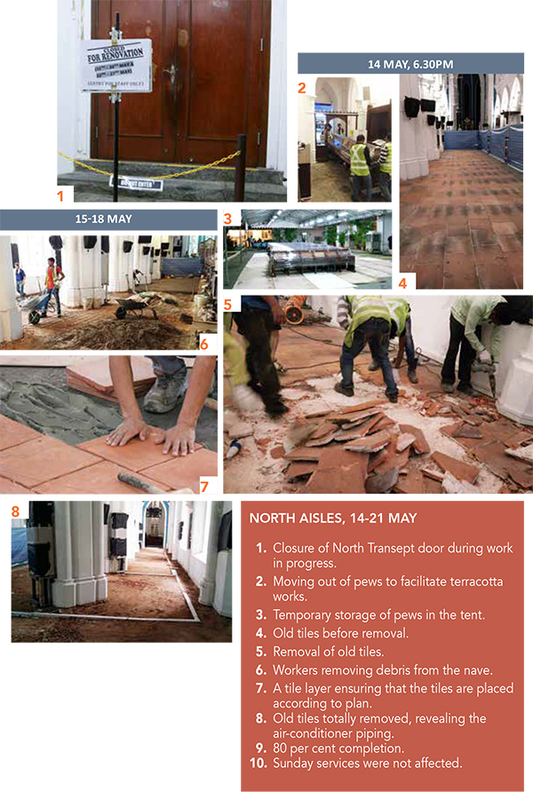 The replacement of the terracotta tiles was carried out over a two-week period. The work started on the North Side of the Nave, followed by the South Side. The contractor had to complete each side over a six-day period, ensuring that the Sunday services can go on as normal. Removal of the affected pews to the tent area, placing protection over all pews and equipment took place immediately after the 5pm service. hacking of the old tiles was done overnight to ensure that we would have sufficient time to replace the old air-conditioning pipes, lay a new screed base, lay the tiles and curing in between, before the pews would be brought back in. The original air-conditioning pipe joints that were concealed in the Nave’s flooring were removed and relocated externally. With this, we will not need to remove the new tiles when replacing the air-conditioning units in the future. Cleaning of the Nave and test-running of air-cons and AV equipment were carried out on the last day. 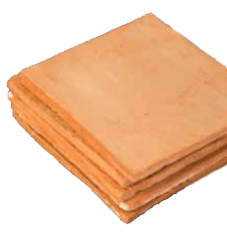 Terracotta is refined mud with very few impurities, that can be shaped when wet, dried in the sun and then baked in a kiln to set. it is one of the oldest tile materials, dating back to the bc (before christ) era. its name literally means ‘baked earth’ in italian. glazed architectural terracotta and its unglazed version as exterior surfaces for buildings were used in Asia for some centuries. There are many varieties of floor tiles being used for churches, including porcelain, ceramic, granite, marble, terrazzo and the more elaborate mosaic patterned tiles. Terracotta floor tiles have been used for churches and cathedrals for centuries due to their wide availability and low maintenance during that time. Interestingly, older cathedrals preferred the use of terracotta floor tiles for their Nave and aisles because it was easy to remove and replace them as and when a crypt needs to be placed beneath the floor. You will notice that the tiles are not the smooth glazed terracotta tiles that you have in homes. Those tiles are machine-made. The tiles in the Nave are hand made to retain the rustic look, similar to the “original” ones, thus making it a like-for-like replacement. Even the laid-out pattern was kept similar to the old ones. The only difference is that the newer tiles are slightly smaller in size at 300mm by 300mm. Sealant was applied on both the top and bottom surfaces of the tiles to protect and prolong the life of the tile surface. We would like to thank our conservator, Dr Yeo Kang Shua; Committee Member from the Mandarin congregation, Mr Lee Chi Kuan; Mr Chern Jia Ding and Ms Cindy Tee, both from PSM for advising us in this work.